A guest post by Emma Barrett, University of Sheffield. On what basis were people sentenced to death in late-eighteenth and nineteenth-century England? Between 1780 and 1880, 253 defendants were convicted of murder and sentenced to death at the Old Bailey, but only 28% were executed; instead, many were imprisoned, transported or pardoned. My initial research hypothesis focused on gender as the most plausible explanation for varied outcomes in the fate of defendants, but extensive investigation revealed a more complex interplay of factors that might account for escaping the hangman’s noose. It has been contended by historians such as Simon Devereaux and Dana Rabin that gender differences and experiences influenced the outcome of sentencing in criminal trials. The historiographical debate highlights that women who committed crimes broadly fell between two opposites: for misdemeanours, they were treated more leniently in the justice system; however, for serious crimes such as murder, women were treated more harshly as they were deemed ‘doubly deviant’ based on social expectations of women’s maternal role, nurturing children and demonstrating purity and good character. In comparison, men were meant to be men: controlling the household, drinking and fighting were accepted traits of masculinity. However, it is clear from my own investigation that gender cannot be used as the only factor in determining different outcomes in murder cases; indeed, for the period 1780-1837 the data indicates similar outcomes in sentencing for both men and women. 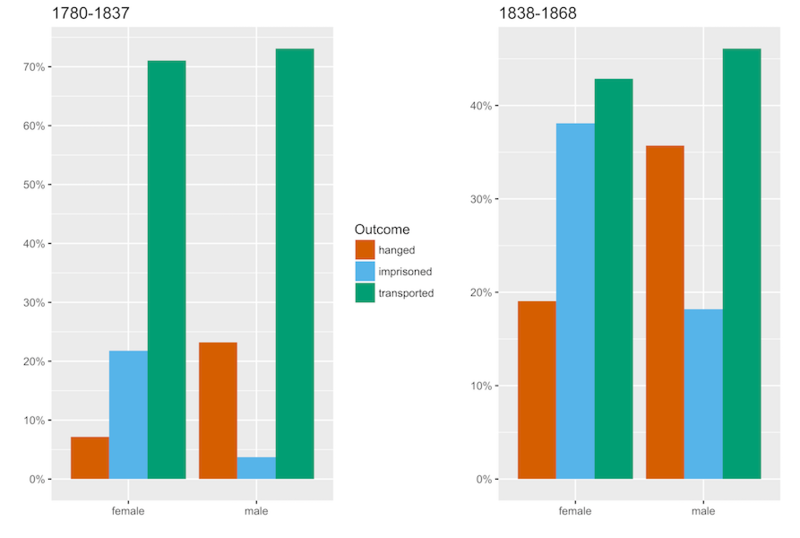 Circumstances after 1838 were affected by evolving views on the death penalty: far fewer offences were subject to death as part of a more general reluctance to employ capital punishment, and here gender did become a more influential factor. This is demonstrated in figure three on the Digital Panopticon’s Penal Outcomes webpage and reinforced by my own research within the Digital Panopticon: 75% of women compared to just 19% of men were imprisoned instead of facing the death penalty. Gender, therefore, as Devereaux and Rabin have argued, did eventually become a consideration in sentencing outcomes during the nineteenth century, but for the years 1780-1837, other factors were more important in influencing the minds of judges and juries. One such factor was the motive of the accused in murder cases. In simple terms, motive in the eighteenth and nineteenth centuries was judged solely on whether a weapon of some description was involved in the murder. Picking up a knife, gun, or brick, whether premeditated or not, was deemed to signify intent to kill. In contrast, beating a victim to death with your bare hands was an spontaneous crime. This can be seen in the case of Michael Crawley. At the age of 62, Michael had a quarrel with his wife Mary and attacked her with a ‘chopper’, inflicting twenty wounds on her head and face and causing death from her injuries on the following day. While in custody his son visited and asked ‘Father, why did you not hit her with your fist, and not take that weapon to her?’ Michael was sentenced to death and was executed for his crime according to execution records for the county of Essex. This is one of the cases that reveals how the justice system was understood within society; in the absence of a weapon, death sentences were less common as there were doubts about the intent to murder the victim. There were some exceptions to this general trend. Michael Carney killed his wife Ann over a dispute. No weapon was used but the prosecution focused on premeditated thought and threats made that were classed as malicious intent. Their daughters and neighbours testified that Carney had repeatedly threatened and beaten his wife and also threatened his children with the same fate. A neighbour, Philip Dyer, testified that ‘I have heard him beat his wife and threatened to murder her, several times’. Carney was executed for the murder of his wife. The difference between intent and opportunity in crimes was still only one of the variables that led to different outcomes in murder cases. Of the executions carried out in this hundred-year period, 35% of the cases could be deemed to have involved intent due to the use of a weapon, but 15% of defendants in cases where the crime can be judged as opportunistic were still executed. To understand these figures further, the nature of the trial itself must also be considered. Trial proceedings offer the historian a glimpse into the life of the convict, their relationship to the victim, and social expectations of acceptable behaviour. In particular, the character of the defendant became a prominent aspect of the questioning process. This included, in limited cases, the demonstration of insanity as a means to evade a death sentence. In Charles Saunders’s case, his mental capacity was judged to be a hereditary aliment passed down from his mother. The Digital Panopticon has a possible death record for him in 1901 at the age of 80, which suggests that a recommendation for mercy was accepted due to his mental state. Whilst not a frequent occurrence in the sample size, this variable was a contributing factor in murder trials. Even more common were discussions about insanity caused by ‘madness in liquor’. Drunkenness was used to support claims of character, albeit without ever being regarded as a “get out of jail free card” in this period. Thomas Robert Davis killed his wife while under the influence of alcohol, but at his trial the marriage was revealed to be a happy one. Once charged with the murder, Davis was left to sober up and it emerged that he had no recollection of murdering his wife; as the constable repeatedly told Davis whilst he was in a drunken stupor, ‘you are not in a fit state to make any statement to me; go and lie down’. Nevertheless, drunkenness in this case did not allow Davis to escape capital punishment: his death record is found in the Capital Punishment database. Additionally, in Peter Masterson’s case, inebriation led to a jury recommendation of mercy as they considered that the killing blow was struck under the influence of strong drink. According to capital punishment records in Kent, Masterson was still executed. Drunkenness was clearly a factor in many murder trials, but within my sample a distinct pattern remains elusive in determining sentencing outcomes during the period. The active role of juries is one of the starkest contrasts between the nineteenth century and contemporary judicial proceedings, as can be seen in figure five on the Digital Panopticon’s Penal Outcomes webpage. Between 1780 and 1880, 22% of cases involved a recommendation for mercy by the jury. These recommendations were made on age (sparing young offenders a death sentence), circumstances, provocation and, most importantly, whether the convict had a “Good Character”. The importance of these recommendations made by the jury highlights the power that they held to alter and influence the outcome. Out of 56 such cases, only two executions took place, that of Michael Crawley. and of Peter Masterson. Juries often sought to spare women who murdered their children from the scaffold. Emily Church is one example of this. Her good character was affirmed during the trial, where she was deemed a good mother until the point of her child’s murder. The jury recommended mercy due to her age and the ‘desperate poverty-stricken condition’ she was in. In this case, the jury also asked the judge, Baron Hawkins, to join in their recommendation. Rather than facing capital punishment Emily was imprisoned (Parole of Convicts, 1853-1925, obtained via the National Archives). An additional case, that of William Tomkins, further shows the role of a “good character” in jury recommendations. Tomkins killed his wife after returning from military service to find she had moved in with another man. The recommendation was given due to his previous “good character” as a soldier, and as a result he was transported to Western Australia (Convict Indents, Ship and Arrival Registers, 1788-1868). In addition, the apparent “bad character” of the victim was also used as justification for mercy, as in the case of Annette Meyers who shot her common-law husband Henry Ducker. While Ducker was in military service the couple exchanged correspondence, and these letters were read out as part of the trial to demonstrate Ducker’s predilection for engaging in affairs with other women: ‘Dear Henry, I hope you are not making a fool of me. If you do not mean to be honourable to me, say so at once’; ‘You know very well, that no other man but you had my company since you wished for it’; ‘if that is all the love you have for me, I do not care for such love, I know you care more for that young woman than you do for me’. Even though Meyers admitted in custody ‘I did it, I intended to do it, I have intended to do it for a long time’, the jury requested mercy due to what they deemed to be extraordinary provocation; she received it and was transported instead. It is evident from this investigation, particularly for the period 1780-1837, that there is no stand-out explanation for how those found guilty of murder were treated by the English justice system. The original hypothesis on gender differences was not uniformly proven in the data, albeit an increasing trend towards the imprisonment of female convicts can be identified after 1838. Additionally, delineating intent does not by itself explain all cases where convicts were sentenced to death. 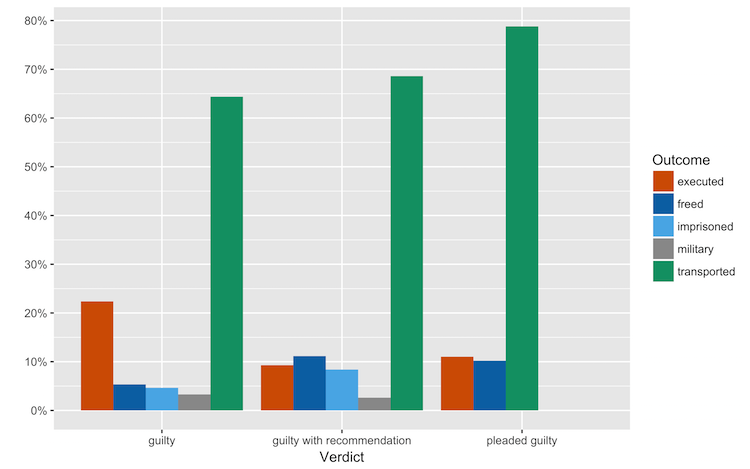 Instead, the surprising conclusion of my research is that the jury held more sway in outcomes than I had previously thought, and what was said during the trial about the defendant and their character played a significant role in their eventual fate, arguably suggesting that the justice system, despite frequent recourse to capital punishment, was more humane than previously thought. This entry was posted in Guest Post, Penal Outcomes and tagged execution, gender, murder on 7th September 2018 by Bob Shoemaker.